Do you have an aspiring race car driver in your life? Or maybe just someone who really likes a good thrill? If so we would recommend gifting that person a course at Skip Barber Racing School. 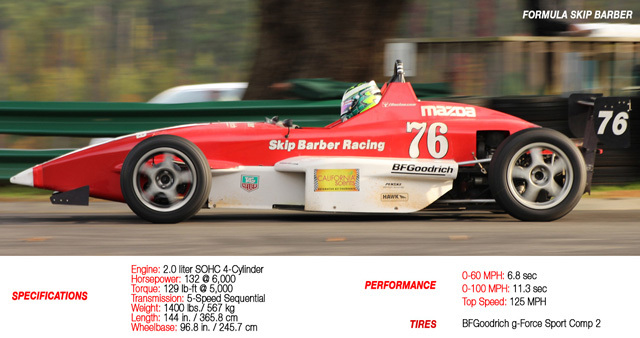 Skip Barber is one of the oldest and most respected racing schools around and they have facilities at most major race tracks in the country. There is also a wide variety of courses that are available. Everything from one day “high performance” driving schools in cars like the Porsche 911 to 3 day racing schools in formula cars. Many of their programs are stepping stones to professional driving careers but Skip Barber is also a good option for those who just want to have some fun behind the wheel. If you are a parent, they also offer teen safety driving courses which; judging by the way I’ve seen some teens drive should be a serious consideration! The downside is that Skip Barber Racing School courses can be pretty expensive. However, there are ways to save money. They usually have promotions and coupons during the holidays and more money can be saved by using your own car rather than one of theirs (as long as it meets requirements). If you can afford it a gift like this will definitely earn you MAJOR points! Just click the source link at the bottom of the post for more info.